Oriental food is the perfect blueprint for healthy eating with fewer calories. Don’t head down to the local Chinese takeaway and fill up with egg-fried rice and sweet and sour pork. Real oriental food is healthy and low in fat, cooked with fresh ingredients and plenty of mouth-watering flavours and spices. Most oriental food is prepared in super-quick time so it has the added benefit of being convenience food! The main principle of stir fries is quickly cooking a mixture of fresh ingredients over a high heat in a wok with the minimum of oil. Coat your wok with light oil spray or a small amount of sesame oil. Sesame oil has the same number of calories as other oils and fats but it’s so highly flavoured, you only need to use a very small amount otherwise it ruins the finished dish. Base the stir fry on lean meat like chicken or turkey or use prawns instead. You can add any combination of flavourings your fancy. The most traditional choices are chopped garlic cloves or a good spoonful of freshly chopped or grated ginger. When cooked, finish with a splash of soy sauce and serve immediately. Stir fries are substantial enough to be a meal but if you wish they are great with freshly cooked rice or noodles. A staple of the Japanese diet, sushi has enjoyed a meteoric rise in popularity. Sushi restaurants are popular throughout the UK and it’s a menu that sticks to the principles of a low-calorie menu. The basic ingredients include fresh, raw fish, sticky short grain rice and vegetables. The other main ingredient is sheets of pressed seaweed called nori. Start by preparing the rice in the usual way and once it has been drained and cooled mix with a little sushi vinegar. This is readily available but if you can’t find any, use some ordinary white vinegar with a little sugar and salt added to taste. Start by pressing the rice into small sausage shapes using your dampened hands and place onto a small bite-size square of nori seaweed. Add extra ingredients of your choice- this could be a shaving of smoked salmon, fresh and thinly sliced tuna or halved king prawns. It’s essential the fish you use is extremely fresh as it is eaten raw. 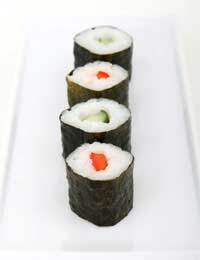 The sushi you make at home is a mere impression of some of the dishes experienced Japanese chefs produce but use the same principles of combining fresh, subtly flavoured ingredients to create superb low-calorie dishes. Sushi is a wonderful option for homemade canapés. A staple in the oriental diet for hundreds of years, tofu is a high-protein, low-fat alternative to meat. It’s bought in the form of a ready-to-use block and is available in its natural form or flavoured. Tofu takes on the flavour of any sauces or spices it’s cooked with. Experiment with the tofu by marinating it before cooking in a simple blend of soy sauce, Chinese five spice and honey. To bulk up low-calorie broths, simply grill the tofu or fry with oil spray. It also tastes great when used as part of a stir fry, soaking up all the delicious juices and providing a lovely, somewhat different texture. Oriental cuisine needn’t be a mystery, explore it as part of your low-calorie diet with its range of different flavours and textures. Quick, low-calorie and healthy - who could ask for more?